The way we travel has evolved a lot over the years. In the early days, people used to walk around with giant folded maps, asking for directions to random strangers. Not that anything is wrong with that, it was just that those methods weren't as great as the ones we have now. For example, not only is using GPS devices more convenient than carrying maps and guides, it’s also much more time saving. These days, all the things you need for your journey are packed neatly into your tiny smartphone, thus fitting a whole bag full of accessories right in your pocket. Furthermore, there are a variety of applications that help us take care of the smallest of hassles we encounter in our voyage. Today, we’ll take a look at five handy apps that makes an Android smartphone or tablet a perfect companion for travelers. 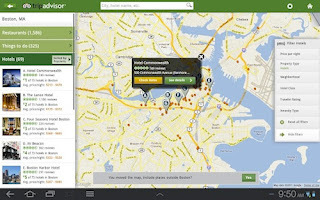 TripAdvisor is a free app for Android that allows you to browse through over 50 million reviews and opinions by travelers about the best places to eat, sleep, and visit. The intuitive app helps you find hotels, restaurants, attractions, and more with tight map integration. Moreover, you can also find out more about places by browsing through thousands of photos uploaded by other TripAdvisor users. 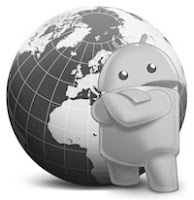 Rated 4.5 out of 5 stars, the app is freely available for download from the Play Store. Co-founded by Reddit co-creator Steve Huffman in 2010, Hipmunk helps you find the best hotels and flights for your trip. Competing directly with Google’s flight search service, the free app shows you the cheapest and the most hassle-free flight. 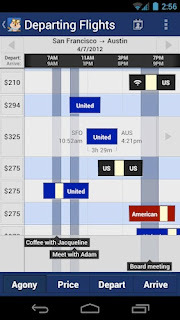 So, for example, you’re flying from New York to Seattle, not only will Hipmunk find you the cheapest deal, it will also take into consideration factors like travel time, number of stops, and more, so that your journey is as comfortable as possible. Furthermore when it comes to finding hotels, Hipmunk shows you a nice map of all the best ones around your area. Above each hotel’s marker, you’ll find the pricing, rating, and a small picture of it. If you’re more meticulous about the hotels you choose, you could also browse pictures of the rooms right from the app. 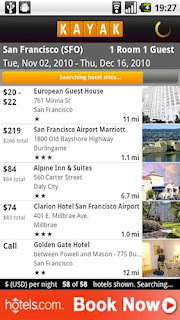 Overall, Hipmunk is undoubtedly the best and the most useful travel app in this list. 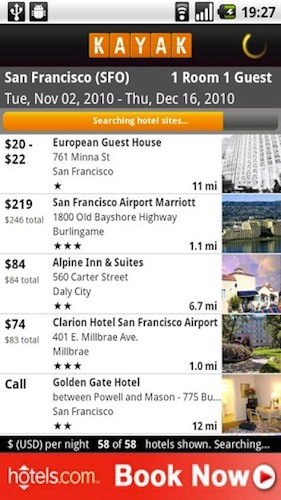 KAYAK lets you compare hotels, rental cars, and flights right from your Android device. Once installed, the free app lets you track your flight status, look up baggage fees, manage itinerary, access airline numbers and more. Rated 4.3 out of 5 stars, KAYAK is freely available for download from the Google Play Store. 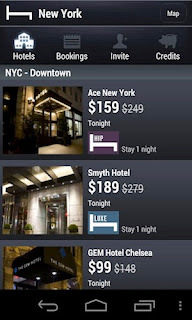 Hotel Tonight will help you find great deals on hotels while planning your next big trip. Limited to U.S cities only, this free app can save you up to 70% on hotel bookings. Hotel Tonight is especially made for frequent travelers who are forced to book hotels at the last minute. Once installed, the app will make sure that you’re not stranded on the airport after your delayed flight. 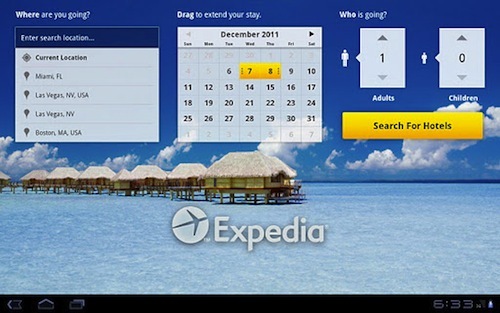 Expedia Hotels is a free app that helps you book from over 130,000 hotel rooms without picking up the phone. Optimized for tablets, the app shows all available hotels in your vicinity on a nice map and then lets you book from any of them. You can then narrow down to the ones you need by using filters based on price, distance, hotel name, and traveler rating. If you’re on the fence about the booking, you can browse through reviews of millions of other Expedia users, thus making the process quite transparent. Finally, when you’re ready to book, you can securely reserve your room without having to worry about security issues. Rated 4 out of 5 stars, Expedia Hotels is freely available for download from the Play Store. Thanks for the great app recommendations. I use Kayak and Hipmunk. I recently took on a new position at Dish which requires me to travel a lot; I quickly learned which apps were useful and which ones only took up space. I have found the Dish Remote Access app to be truly indispensable. It allows me to stream live TV and DVR recordings anywhere I go. There has been more then one occasion when a flight has been delayed or canceled and I was left in an airport with nothing to do for several hours. Having a little entertainment really helped save my sanity. Of all the travel apps I have tried, I would never leave home without the DRA app.